When do we start? When should we finish? The snow that fell yesterday — yes snow, yes on May 12 — along the northern Front Range of Colorado has just about melted and it looks like spring again, even though it doesn’t necessarily feel that way when one steps outside. The mountains give the appearance of mid-winter, which is encouraging given the lower-than-average snow pack to date. In any case, the questions that form the title of this post are among the most frequently asked when I am both training and coaching. The context is Sprint begin-end boundaries and the answers I give are consistent. I encourage organizations and teams to follow the Lean principle of building-in quality, that is, make everything as unlikely to break as possible. When it comes to Sprint boundaries, regardless of the length of the Sprints, the least likely candidates are starting on Mondays and ending on Fridays. There are several reasons why Monday-Friday Sprint boundaries are suboptimal. In the USA at least, most holidays fall on Mondays, almost certainly assuring disruption of Sprint planning at least a few times every year. And while ending Sprints on Fridays might seem to offer the prospect of a nice break in between Sprints, the all-too-common refrain from the team at the Sprint Review is: “Oh yeah, we’re done with everything, but we just have a little testing/coding/cleanup, etc., to finish over the weekend.” Uh-oh. Fortunately, there is an extremely simple method of fixing these (and many other) common problems resulting from Monday-Friday Sprint boundaries: start and finish in the middle of the week. 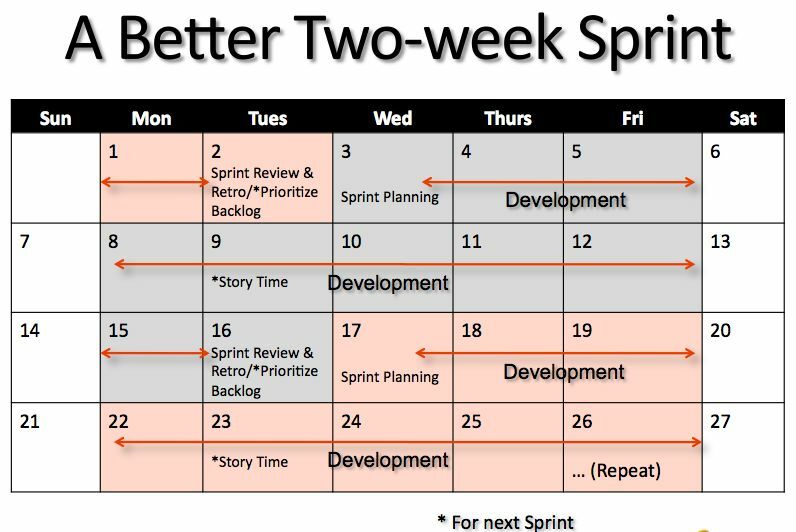 I personally like starting fresh with Sprint Planning on Wednesday mornings and wrapping up with the Sprint Review and Retrospective on Tuesday afternoons. Using this Sprint boundary template immediately remedies the Monday-holiday disruption. Finishing the Sprint on Tuesday afternoon — with the Retrospective as the last thing the team does, always, without fail — very neatly eliminates “we’re done, but we’ll finish over the weekend” syndrome as well. This one element, finishing work, is worthy of another blog post all to itself. 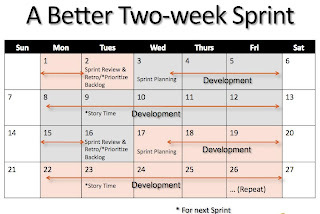 Closing out each Sprint on Tuesday with the Retrospective provides the team with the full experience of accomplishment and closure, of finishing the work of one Sprint before moving on to the next. Indeed, I invariably find that teams are anxious to get started on the next Sprint and welcome the opportunity to start fresh the very next morning. An added benefit is that holding Sprint celebrations on Tuesdays often results in a smaller tab at the team’s favorite restaurant or bar, which often offer discounts to encourage mid-week trade. Think about it and let me know about your experience with Sprint boundaries.